It was my husband and daughter who visited this place on an outing together. They liked the chocolate mousse pie so much that they phoned me to tell me about it. Actually ‘taunting’ is probably a better word because they didn’t buy any to bring home, nor any of the chocolates that they tried and loved there either. Situated in Hub Arcade just off Little Collins Street in the heart of Melbourne, Chokolait is a fairly unassuming shop that has only been around for a couple of years, but has already been discovered by chocoholics, coffee drinkers and specialised walking tours. They use Belgian and Swiss couverture as the base for all of their desserts and chocolates and have dark, milk and white/milk blends on hand to try. Two of them are Callebaut (Belgian) but I couldn’t guess the Swiss one – I’ll just have to revisit and keep trying. This is a lovely dark chocolate that reveals a mousse with mixed berry flavours inside. It is a more sophisticated version of Nestle’s ‘Mixed Berry’ club classic block. Nice Belgian milk chocolate that encases a flowing pale pink strawberry fondant. Very sweet and a nice foil to the bitter coffee I was tasting these with. This tasted just of a very nice creamy milk chocolate with buttery centre to me; the actual fruit flavour was negligible. Delicious. The caramel is a solid, brown sugar kind that isn’t chewy or dribbly. Perfect texture and divine flavour. My favourite of the lot. Being a lover of the actual drink, I was wondering how this would translate into chocolate. The answer is rather well, in fact. Nice creamy, spicy flavours throughout the soft white chocolate which makes me wonder why other chocolatiers aren’t trying this. This dark shell of chocolate covers a slightly lighter and much creamier coffee filling inside. Rich and mousse like, it is my equal favourite and one of the best coffee-themed chocolates I’ve tried in a very long time. This is a classic done particularly well. Dark chocolate, soft fondant base inside cushioning a real glace cherry and coughingly-strong liqueur. All the flavours combine and then release themselves individually to create several sensations across the palate. These might be too much for some people, but I find them devilishly moreish. Can this be an equal top three favourite? Same filling as the standard chocolate, but larger and therefore even nicer. I’ll definitely be returning to try the coffee, the very famous mousse cake and to find out more from Ross, the owner, chocolate maker and generous giver-out of free tastings. 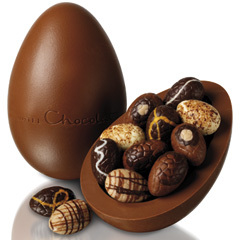 The eggs look so much like the Hotel Chocolat ones! I’ll have to trust your judgement on that Maggie because I *sob* have never *sob* tried the Hotel Chocolat *sob* ones….